The target audience for this book is any IT professional responsible for designing, configuring, deploying or managing information systems. This audience understands that the purpose of ethics in information security is not just morally important; it equals the survival of their business. A perfect example of this is Enron. Enron's ultimate failure due to a glitch in the ethics systems of the business created the most infamous example of an ethics corporate breakdown resulting in disaster. Ethics is no longer a matter of morals anymore when it comes to information security; it is also a matter of success or failure for big business. 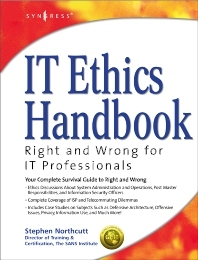 This groundbreaking book takes on the difficult ethical issues that IT professional confront every day. The book provides clear guidelines that can be readily translated into policies and procedures. This is not a text book. Rather, it provides specific guidelines to System Administrators, Security Consultants and Programmers on how to apply ethical standards to day-to-day operations.